Tag Archive | "Orgone Device"
A strong orgone device was activated with a controlled dosage of a very small amount of radioactive material. Electrical capacitance and other effects were examined. Possible anomalous occurrences are noted in terms of a small increase in electrical tension in chemical batteries and electronic capacitors placed within the device. Other possibly anomalous reports are noted such as small changes in radioactivity, temperature, magnetism, luminescence and subjective observations associated with the device. The long term research goal is the examination of orgone and consciousness. It was assumed that future experimentation would involve high orgone concentrations and possibly self-generation of small amounts of electrical tension. This first experimental step therefore was to investigate high orgone concentrations and the possibility of any self-generated electrical activity within a strong orgone accumulator (ORAC). As radioactivity is thought to be the strongest activator of orgone (1), oranur or (orgone versus nuclear) energy was studied through the ORAC. An approximately 6 foot by 3 foot human-sized ORAC cabinet was placed horizontally. At first the door was removed and placed underneath the cabinet to give extra layering. Putting the cabinet back upright was tried but this decreased the charge by approximately 20% according to a Heliognosis Life Energy (LE) meter device. It also made placing of the internal items difficult. The cabinet was put back on its side. Eventually, the door was put back on. Inside the cabinet there was placed one, and then two large 2 foot square orgone accumulating boxes with one side removed (originally developed for orgone acupuncture). A suitcase of accumulating materials was added alongside two orgone blankets and another two smaller orgone boxes. The large orgone box had two orgone tubes pointed at it. Altogether approximately 12 orgone devices were inside the larger ORAC cabinet. This was done to create a strong orgone field but also to create synergy between devices and hopefully a flow of orgone, one device would activate another so increasing the overall charge. Reich believed a central characteristic of orgone was interaction between energy systems (2). 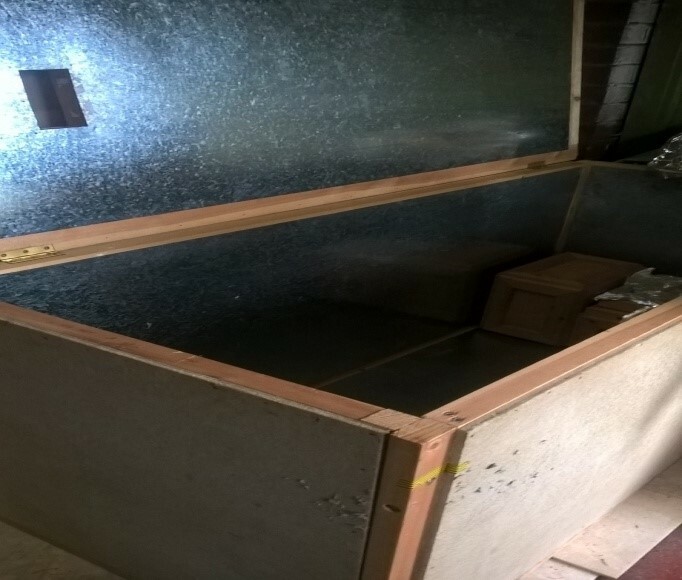 The inner boxes were made of steel, rockwall and celotex type panels on a wood frame – standard materials for an ORAC. The orgone suitcase was filled with insulating rockwool and steel wool layers and had an outer layer of aluminium foil and then lastly plastic clingfilm around the outside. The orgone tubes were steel tubes with 300 plus double layers of aluminium foil and clingfilm, based on Bernd Senf’s design for orgone acupuncture tubes (3). The cabinet was made of the standard ORAC materials similar to the inner boxes. 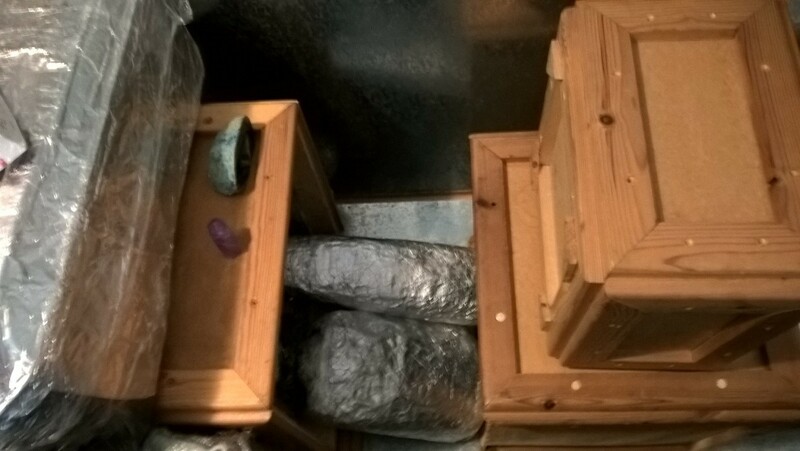 Close up of inside of cabinet showing the orgone suitcase (uppermost left). Two orgone acupuncture boxes connected with orgone acupuncture tubes (lowermost). The third box is a small orgone acupuncture box. A rechargeable AA size battery of some years of non-use was put within the inner box of the orgone device. It was covered in orgone layering (plastic and aluminium foil) and one month passed. This was in the autumn of 2017 and the charge in the device appeared to be increasing. A small amount of radioactive americium was used with the intention of activating the orgone device. The americium was within a smoke alarm and was kept intact within the body of the alarm. The amount was 0.9 microCurie or 0.26 mcg of americium-241. As the americium was being gradually moved closer to the orgone device during the battery charging, both subjective impressions (a feeling of ‘density’, ‘skin tingling’ and ‘sun tans’) and objective readings (LE and Geiger meters) showed an increasingly higher charge from the device over the period of the battery charging. The weather was also warmer and drier at this time (compared to the later experimental periods over the winter-time). The first battery was not expected to show any changes so prior measurements on it beforehand were not done. The only test was to put it in a clock (which it wouldn’t run before the orgone charging). The battery was many years old and hadn’t been recharged for a long time. It had been stored at room temperature for years in dry conditions. After a month of orgone charging it ran the same clock for several days. Then when it stopped running the clock, after further orgone charging, it continued to run the clock for some hours. A second long-flat AA sized battery also began to run the clock after orgone charging for some days. The batteries that ran the clock were now tested with voltmeters and were at approximately 700 millivolts (mV) or less than half of capacity. Next, a larger old rechargeable battery, a D in UK sizes, was checked with two voltmeters, both confirming it was at zero mV. It had orgone layering put around it (plastic and aluminium foil), and was placed within the inner orgone box of the device. Over a period of 1 week it gained charge daily before levelling out to around half of capacity (it peaked at 630mV). This battery was tested beforehand and then daily. At first there were small flashes only on the voltmeter then it climbed steadily from 400mV to 610mV. It peaked some weeks later at 630mV. Sometimes it would lose mV when removed from the orgone device and then regain it when replaced over the next few weeks. Apparent recharging of the batteries however could simply occur by a known rebound effect whereby empty batteries bounce back up to about ⅓ to ½ of capacity. However with the batteries used so far this appeared to be an unlikely explanation as they were many years old and most likely stable at zero or low mV due to their age and having not been used for a long time. There were also no sudden environmental changes as the batteries had been stored and then orgone charged at room temperature. To clarify the rebound issue new rechargeable batteries were obtained and attempts made to get them stable at zero mV, which is actually more difficult than it would appear. The rebound process is quite strong in new batteries, to the extent that the query came to mind as to whether chemical batteries use a level of orgonotic charge normally. As soon as they are zeroed they pull back mV charge to about ⅓ of capacity. It is not perhaps entirely clear that this is solely a chemical phenomenon. Such batteries are like a chemical ORAC in some ways, with their internal metal electrodes, surrounded by chemical electrolyte in a metal and plastic layered casing. Modern rechargeable batteries are using novel materials to make recharging even quicker and easier. Perhaps they are in part using an unknown orgonotic effect. After some weeks of trying various methods a few new batteries were stable at zero. A small light bulb circuit or battery-operated hair clipper had been used to run the charge down. In some cases they had to be short circuited with bell wire from the terminals to reduce the last few mV of charge. They were then orgone charged in the device. However now it seemed difficult to repeat the possible effects seen the first three times. Perhaps an unknown combination of factors, some unknown, had enabled the earlier batteries to gain charge. The first D battery particularly seemed to gain a noticeable amount of potential in mV each day, but still it was thought that the electrical conversion of orgone into electricity was at a relatively low level. Even a USB battery charger would supply at least 300mV so the estimation of 10-30mV continual conversion in the orgone device is not going to be at a level with which it would be easy to achieve an effect on chemical batteries. To repeat the experiment as described here one would have to not connect a load to the battery whilst charging it. Also one would have to use as high an orgone charge as feasibly possible and proximal orgone layering in addition to that. The low level radioactive activation may also be a required element. 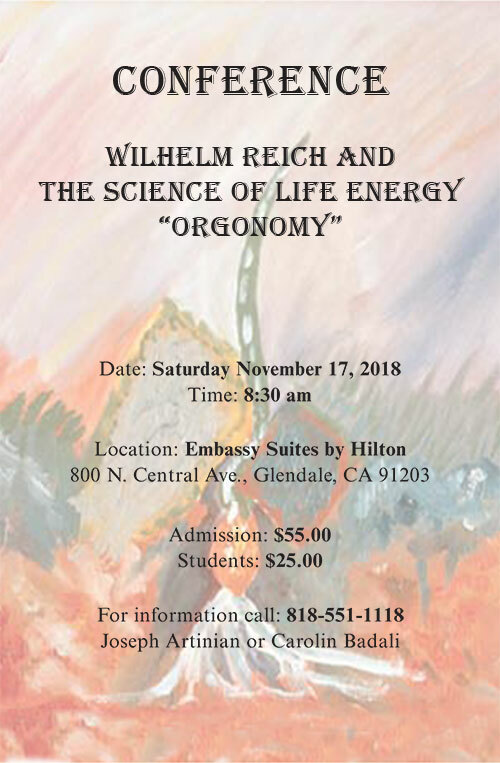 Reich often found that to orgone charge something effectively the orgone layers had to be near the object, for example he used metal shielding immediately around his Geiger tubes and ORACs were built according to the size of the organism to be charged, mice had special small ORACs and humans had human-sized ORACs. Glass seems to provide the strongest ‘condensation’ of orgone as shown in Reich’s work with the Geiger tubes and the orgone motor. So a glass ORAC container for batteries or capacitors might provide an avenue to explore. The experimenting with chemical batteries is ongoing (both orgone charging from zero mV and orgone charging from previously part mV – see below). It might take some months or even years to regain the possible effects seen in the first three batteries, if at all. Also the peak charge of the orgone device has been purposefully allowed to decrease a little. It has been noted that pyramids may have a charging effect on batteries. Modern Russian large pyramid research also reports an electrical capacitance effect although the synopsis articles do not describe it in any detail (4). Older Western literature on pyramids describes poorly controlled pilot experiments using batteries that have not been previously stabilised at zero mV. However, an increase in the ‘rebound’ effect after pyramid charging batteries has been noted in various popular 1980s books, for example in King’s book (5). Reading the pyramid research prompted some ideas that might be applicable. This author has questioned elsewhere whether the architectural design of Reich’s orgone motor produced amplification rather than a simple creation of electricity (6). As previously noted, Reich emphasised that orgonotic phenomena need an interaction between orgone systems in order to occur. This suggests that another way to examine any chemical battery effect might be to take relatively stable but non-zeroed batteries, perhaps with a couple of hundred mV in charge, and then to orgone charge the test batteries whilst keeping the controls in a similar light, temperature and static charge environment without additional orgone charge. With this experimental procedure there would be an initial electrical charge for attempted amplification via the orgone system. Also, the electrical charge of the test batteries might interact with the orgone device creating an enhancement effect. As noted, pyramids have been thought to have an electrical capacitance effect. Seiler, a Swiss orgone researcher did not examine electrical capacitance but in the 1980s researched if ORACs in the shape of pyramids may enhance orgonotic effects. No effects were found (7). However this is what this author would expect. From what can be ascertained this author’s view is that pyramids act foremost as a transformation device somewhat like an orgone transistor. ORACs might rather be capacitors of orgone energy. One might see an increase in orgone charge therefore when an ORAC is placed within a pyramid rather than a change when an ORAC is shaped into a pyramid. The latter approach might confuse effects by mixing different functions (capacitance and transformation). Russian researchers avoid metal in their pyramids so perhaps these aspects are already known in some way to those scientists. The first pilot experiment in this area – amplifying charge in chemical batteries, appears to tentatively support this idea. A number of batteries were checked for stability of charge for three days, at room temperature. They were mostly around 100mV or just below. Two of the D sized batteries and an AA battery were put in the orgone device and one D battery in a comparable control environment. The orgone D sized batteries gained 100% of charge in a week. The control D battery gained 50% of its original charge in the same time. The orgone charged AA battery only gained 2 mV in the same period which was about 3% of its original charge. Further preliminary studies are obviously needed with this aspect. Aside from the above preliminary experiment, a number of part-charged batteries were placed within the orgone device on an informal basis to get an idea of what effects may be occurring. They were not strictly controlled for prior fluctuations or ‘rebound’. It is interesting to note though that most appeared to gain charge at a steady but modest rate suggesting something is perhaps happening. Any effect is by no means even however, sometimes it appears to tail off and other times it appears stronger, perhaps connected to wider environmental conditions. All the charts in this article describe approximate indications of values to give an indication of the relationship between various variables. Rebound of new batteries on the other hand tends to happen quickly and predictably (within minutes) and the empty battery jumps back to about a third of capacity in the author’s experience (from a few hundred mV or less) and then stays at that level for some time. This rebound effect doesn’t appear to happen with older, stable batteries. The effects in the orgone device on the other hand appeared to be a steady gaining of charge of up to about 50 to 100 mV a day rather than the big jumps seen with rebound in newer batteries. Mostly used older batteries were utilised when the possible charging effects from orgone were seen. The bigger D batteries seem to gain charge more easily than smaller AA batteries. Further experiments with large batteries could be useful. Perhaps the increased area and quantity of electrolyte or increased metal surface area in the larger batteries enhances the orgonotic interaction. The level of initial electrical tension is likely to be instrumental too. The D and C size batteries appear to be the most promising currently. Looking back on the data it appeared that the possible battery charging from zero occurred when the orgone device was reaching a peak due to the oranur aspects and possibly the autumnal weather being more conducive than the later winter weather. Oranur energy is created when radioactive materials trigger the orgone energy into higher activity and is the strongest trigger of orgone according to Reich (8). In the autumn the weather is also sunnier and drier than the winter and therefore more conducive to higher orgone charges. 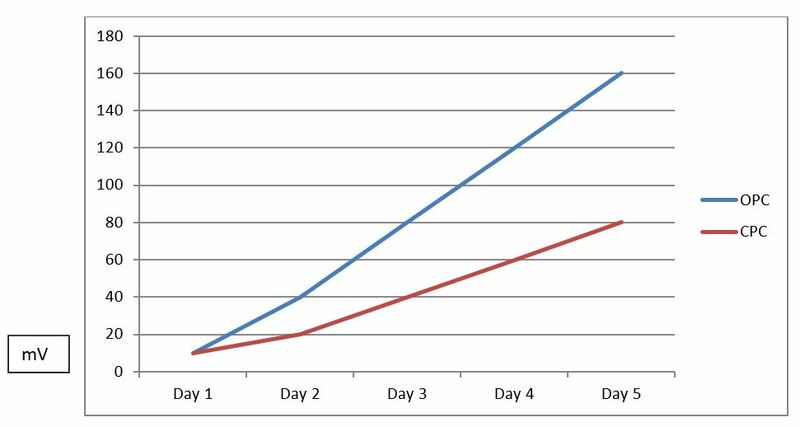 The rebound effect is actually sharper than is shown here and usually occurs in minutes rather than over a day. ‘Org D’ is the first D sized battery that appeared to recharge in the orgone device, ‘Org 1&2’ refers to the first two AA batteries which ran the clock after orgone charging. An electrical engineer suggested the use of electronic capacitors in order to bypass the problems with excluding rebound in chemical batteries. Electronic capacitors were envisaged by this author as being easier to orgone charge than chemical batteries because they are simpler and non-chemical based. Also it is noted that they are already a mini-ORAC, being a plastic outer shell with two metal plates inside (the electrodes) with non-conducting material sandwiched between layers of metal. So there is metal/die-electric layering as in an ORAC. This is illustrated in Figure 5. 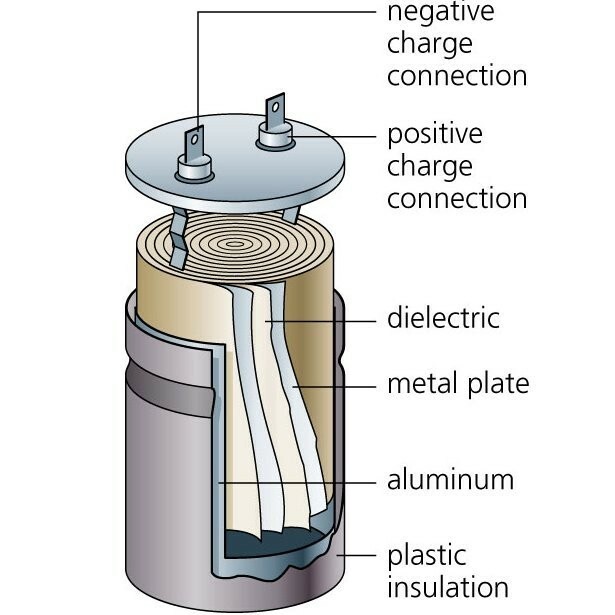 The inside of a capacitor is similarly layered to an ORAC, the dielectric, non-conducting layer is noted to be similar to the organic layer of an ORAC. 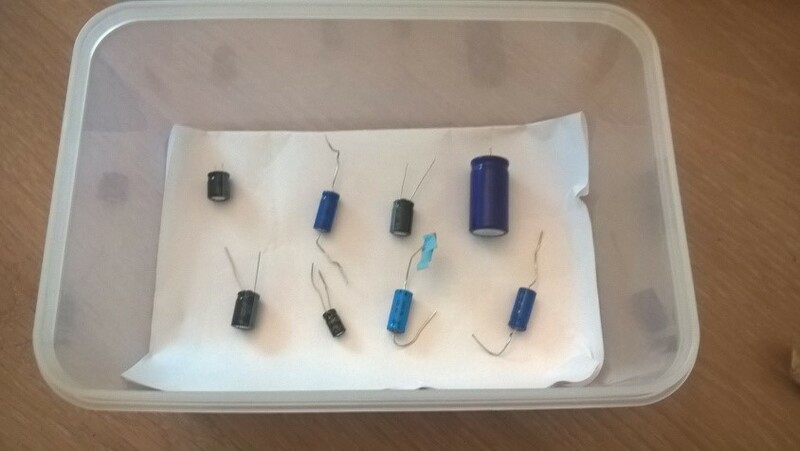 Capacitors in a plastic box ready for orgone charging or use as controls. After informally charging a number of capacitors to see how they might react to environmental factors, the first orgone-charged versus control set of capacitors was set up controlling temperature, light and static conditions. The capacitors required zeroing via short circuiting before experiments could be started (a small length of bell wire was attached to the positive and negative terminals of capacitors for between 10 seconds and 2 minutes depending on how long it took to zero the electrical tension). The first preliminary experiment was in October 2017 and used just two identical capacitors, one test and one control. They were both kept at a similar room temperature, light and static conditions. The mV readings were measured daily. The experimental capacitor was consistently slightly more than double the tension of the control capacitor. The voltage of both orgone charged and control capacitors gradually increased daily but at a greater rate in the orgone capacitor. The second set of capacitor experiments involved 10 assorted electronic capacitors in two plastic containers. All capacitors had been zeroed before the experiment began with bell wire attached to the positive and negative terminals. The sixth capacitor in the first box had a small paper flag attached to it in order to see if this would attract extra charge. The second box of capacitors had two capacitors in it, one with proximal orgone layering and one without layering. Altogether between box 1 and box 2 there were 10 capacitors. All the capacitors were naked apart from the 10th capacitor which had proximal orgone layering. The range of tension measurements after the experimental period was between 1.1 and 94 mV in both orgone and control groups. The 6th capacitor in box 1 (with the paper flag attached) behaved differently to the other capacitors. It gained more charge when it was acting as control than when it was within the orgone device. All the other capacitors in the orgone test group however gained more mV than the control group (between 2 and 20 mV averaging around 15 mV gain over the controls). The 10th capacitor, the proximal orgone-layered capacitor in the second plastic box, behaved slightly differently. It gained only a little more in the orgone group than in the control environment. However its immediate neighbour seemed to attract much more charge gaining 15.8 mV in the orgone device compared to only 1.9 mV outside it. A third set of capacitor experiments were undertaken again using 10 capacitors in two plastic boxes (8 capacitors in the first larger box and 2 capacitors in the second smaller box). All capacitors were zeroed before the experiments began. The plastic boxes were then placed either within the orgone or control areas according to the phase of the experiment. The first plastic container had 8 assorted capacitors of various electrical capacities as in the previous run. The second smaller plastic box contained the capacitor with the proximal orgone layering and the neighbouring capacitor without layering, again as in the previous run. The plastic containers which held the capacitors were put inside the inner box of the orgone device or in the control environment depending on the part of the experiment being conducted (in the previous run the orgone capacitors had been in the outer part of the orgone device). The orgone charged capacitors were all higher in this run of the experiment. The small paper flag had been removed from the sixth capacitor in the first box and this then responded in the same way as the other capacitors. Also in the second smaller plastic box, both the proximal orgone-layered capacitor and its immediate neighbour more clearly outperformed the other capacitors with both doubling their charge compared to control. The other capacitors all gained charge compared to controls of between 1 and 22 mV, it seems one capacitor will ‘hog’ the charge from its neighbours gaining a much bigger differential than the others. The increase was in the same range approximately to the first run. A fourth set of capacitor experiments was undertaken. This time the temperature and light were better controlled within about 1/10th of a degree centigrade. The light and static electrical conditions were similar. In order to get the conditions more exactly matched the same building was used, a stand-alone brick garage. 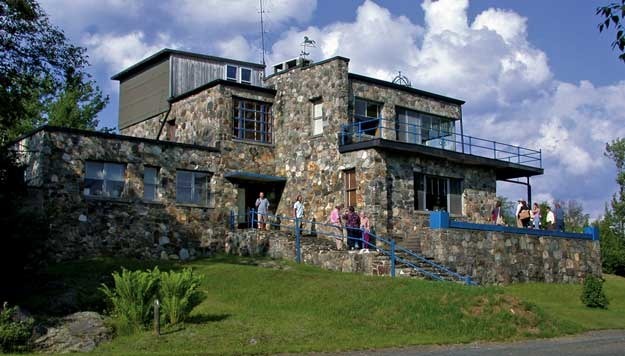 All the electrical experiments apart from the first run with just two capacitors were conducted with the orgone device in this building. It had been noted that the field of the orgone device might extend 18 foot or more (affecting both sets of capacitors). This was suspected as it appeared that batteries kept some distance from the device were not losing charge normally but a confirmation of this experimentally had not been obtained. Also subjective impressions made one aware of an extended field. The orgone and control groups were therefore put as far apart as possible (about 12-14 foot). The orgone device was toward the right hand corner of the garage and the controls were kept in an identical plastic container in a dark wooden cupboard in the far left hand corner of the garage. The orgone group plastic box was also given proximal orgone layering by wrapping the box in layers of foil and plastic clingfilm. Four capacitors of different size but identical between the orgone and control groups were used without any proximal orgone layering immediately around the capacitors in both orgone and control groups. A single orgone capacitor reading had to be discarded as the capacitor had come loose and was short circuited on the metal layering inside the plastic box, this was corrected and the experiment continued. After 24 hours the orgone capacitors were at least four times higher than the controls. 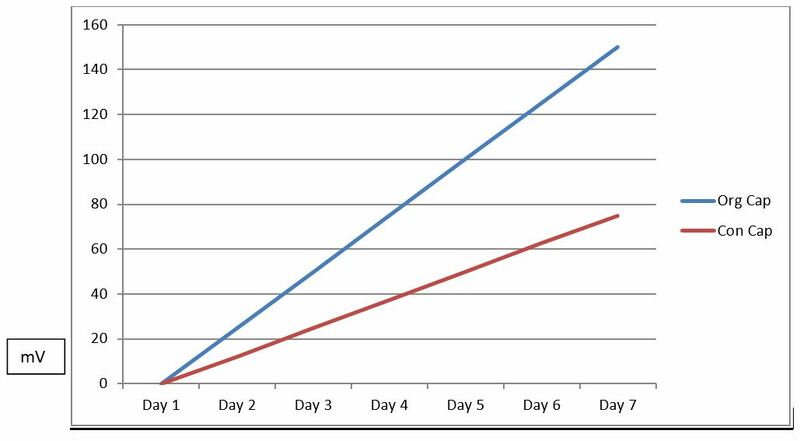 Over the next few days this differential gradually evened itself out until after a week the mV charges were approximately the same in both groups though most were slightly higher in the orgone group overall. This may indicate that the electrical influencing field of the orgone device may reach at least 12-14 foot but that it is stronger nearer the device. Different sized capacitors appear to behave in a varied manner when orgone charged. Hence the need was felt for a mixture of capacitor strengths in each group, orgone and control. However orgone and control capacitors were always exactly matched between the groups. A fifth set of capacitor results are worth detailing. The author was curious as to whether a group of capacitors would behave differently when orgone charged than capacitors placed on their own. A bag of capacitors was left inside the orgone device for some two months. It was additionally placed within a mini-ORAC whilst inside the device and ‘squeezed’ by the placement of other items, including accumulating materials. This bag of 30 assorted capacitors was not planned to be part of the preliminary, pilot experiments and therefore the individual capacitors were not zeroed via short circuiting prior to placement. Most unused capacitors however tend to be low or zero in mV charge when tested for the other experiments. Six capacitors were taken from the bag and all were anomalously high in charge, full size capacitors varied from 96.4 to 505 mV and two mini-capacitors, which have been found to normally be zero mV as new, were 3 mV and 40 mV respectively. The capacitors were new and unused prior to the orgone charging. It appears possible that groups of capacitors may have some kind of interaction effect enhanced by proximity. Any further capacitor experiments undertaken by the author will take this factor into consideration. The temperature within orgone devices has been noted to be higher than the ambient surroundings in a number of controlled experiments since Reich’s discovery of the effect. It is termed TO-T for Temperature Orgone versus Temperature (control). Rigorously controlled TO-T experiments have been conducted by Demeo and others (9). To-T suggests that there is an anomalous energy accumulated in the ORACs. The temperature in the inner box of the orgone device, the immediate surroundings of the device and a control room were compared. The orgone device did not have a lid at first (it was placed underneath to increase the number of layers). In any case the device seemed to affect the temperature of the whole room. An identically treated room immediately next to the orgone device room was therefore used as control. Temperature was measured over 4 weeks with a good quality but standard household electronic thermometer accurate to 1/10th of a degree centigrade in October 2017. There was a small differential, but only at times, between the inner box of the device and the orgone device room. However between the orgone device room and the control room immediately next to it there was an almost constant differential of between 0.1 and 0.8 degrees centigrade averaging around 0.3 to 0.4 of a degree Celsius. A correlation between the placement of the americium nearer to the device and a change in temperature orgone (TO) was not noted though it may have occurred and been too subtle to notice. The weather records were not frequent enough to observe any correlations between TO and weather conditions though such may also have occurred. To-T was recorded for four weeks in the autumn of 2017. Weather was a usual mixture for the North West of England, of mostly cloudy conditions. Temperature was recorded at the same height in each room. Heat sources in the premises were kept entirely off during the weeks of recording temperatures. A Heliognosis Model II Experimental Life Energy Meter (LE Meter) was used to take a number of readings over 6 weeks. 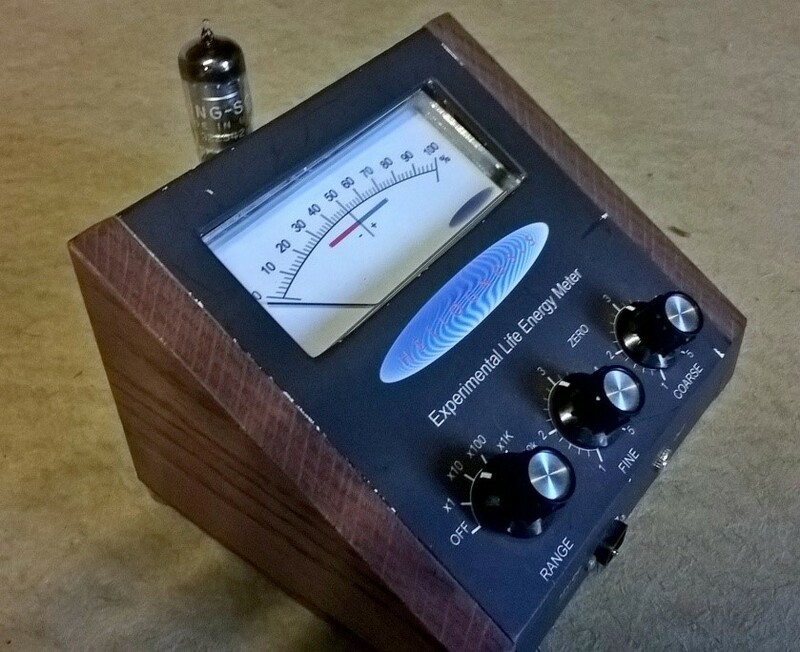 The meter uses electrical interaction to indicate the strength of orgone fields. Reich developed the first device which has since been modernised and miniaturised. A number of readings were taken on a daily basis. A reading was taken at the entrance to the orgone device room (Room 1), a second reading 3 foot from the orgone device was taken (Room 2). A reading was also taken at the outside wall of the orgone device. Another two readings were taken inside the device, firstly at the inside of the outer wall of the device and secondly inside the inner box. The field from an orgone charged piece of orgonotic compound (resin, metal and crystal mixture) and the field from a similarly sized crystal were also measured. Lastly the radioactive americium was measured in two locations, at the entrance to the orgone device room and 3 foot from the device. Fine and Coarse dials were used throughout the experiment. The pointer arm was checked to be at approximately zero away from the orgone device before readings were commenced. Most of the readings were as expected. Room 1 was usually about half of Room 2, indicating a fairly large field getting stronger nearer the device. This was as expected. The outside wall of the device, the inner and outer walls of the device all gradually increased in charge from the outer to the inner readings. There was also a gradual increase in the consistency of the LE meter readings of the inner boxes of the device as the americium radioactive source was moved closer to the orgone device. The americium had five placements, 12 foot, 6 foot, 3 foot, 1 foot and inside the orgone device. After a few weeks the inner box of the device was consistently reaching the maximum on the LE meter (100%). 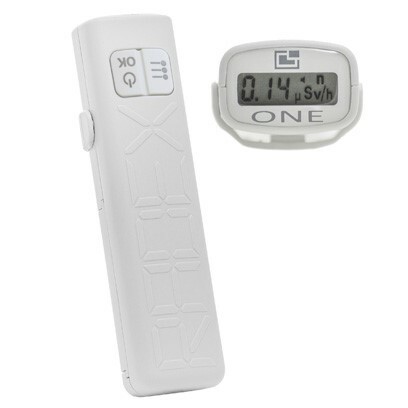 The outside of the device would read between 40% and 60% usually. To give an idea of the readings, a person’s hand on the same settings on the LE meter and at the same distance, varied from around 40% – 60%. A second surprise was the orgone charge readings of the americium itself. Each day the americium was taken from its placement at the allocated distance from the orgone device (see paragraph above) and measured at 3 foot and 9 foot away from the orgone device. The americium had an orgonotic field around it measuring up to around 24% on the LE meter. However, the orgonotic field the americium produces appears to depend on how near the americium is to the orgone device. When the americium is at position 1 (about 9 foot away from the device) at just outside the orgone room, the reading was between 10% and 24% generally. However when the americium was measured 3 foot from the device, this dropped to a quarter of this level on daily readings over a few weeks. This differential dropped when the permanent placement of the americium was moved closer to the device but was still evident. The americium now had a quarter more orgone charge away from the device compared to close up, for example 24% away from the device compared to 18% near the device was about average. The orgonotic field of the americium appeared to be suppressed near to the orgone device. Nearly every reading seemed to confirm this effect. The small piece of an orgonotic compound (resin, metal shavings and crystal) and a similar-sized crystal was orgone charged in the device and readings taken with the LE meter. The orgone compound behaved similarly to the crystal and both gained and lost a modest amount of charge at the same time in a cyclical manner over the weeks. The orgone compound had approximately ⅓ higher charge than the crystal. A small amount of radioactive americium-241 was used in the experiments. The americium was present inside a sealed smoke alarm in which it remained for the duration of the experiments. In terms of activity, it was 0.9 microCurie of americium. This corresponds to an amount of 0.26 microgram (mcg) of americium. It was first placed 12 foot away from the orgone device. After a week it was moved to 6 foot, then 3 foot a week later, then 1 foot, then within the device for a day and lastly just outside the device again. After 5 weeks the americium was removed from the vicinity completely. Reich used one milligram (mg) of radium-226 in the original oranur experiments. This corresponds to 1,111 times the radioactivity used in this experiment . The actual radioactivity readings from the americium, on a Geiger counter, are barely over the background count of 0.08 to 0.12 microSievert per hour (uSv/hr) noted locally. Typical readings of the americium would be around 0.18 uSv/hr making it just 0.06 uSv/hr above the background count of 0.12 uSv/hr. The background count, away from the orgone device (of about 0.08 to 0.12 uSv/hr) was measured repeatedly at two local points, indoors and outside. The uSv/hr count both of the radioactive material and near the device varied. There was also a suppression effect of the uSv/hr readings within a few foot of the orgone device. This will be detailed later in this section. A new Radex One Geiger counter was used to measure readings at a distance from the orgone device (about 24 foot) and close by (3 foot). This was measured in microSievert per hour (uSv/hr). The radioactivity readings remained within normal limits and were around 0.08 to 0.22 uSv/hr. However there was a slight raise over the background levels of 0.08 to 0.12 uSv/hr so that the absolute readings varied between 0.12 and 0.22 uSv/hr. Reich used Counts Per Minute but this measure varies depending on the Geiger tube in the counter so uSv/hr are the standard today. In CPM the background count would be roughly 20 CPM using the Radex One meter. The daily uSv/hr readings reflected the LE meter readings in that again there was a suppression effect near the orgone device. The radioactivity readings were suppressed by about one third compared to away from the device. The uSv/hr readings inside the orgone device were not noticeably different to 3 foot away. There was not a noticeable rise in the uSv/hr readings when the americium’s permanent placement was moved from 3 foot away from the device to 1 foot from it. A typical reading was around 0.16 uSv/hr 18-24 foot away from the orgone device (compared to 0.12 uSv/hr close by). Almost all the readings showed a modest suppression of the uSv/hr readings of about 25% close to the orgone device and a small raising of the uSv/hr over background within the extended field of the device (6 to 24 foot). The Geiger counter was only obtained in the last two weeks of this phase of the experiments (environmental measurements) so there was not a lot of data collected. The americium’s stationing had already decreased to 3 foot from the orgone device by this time. From 3 foot to 1 foot from the orgone device, no clear pattern emerged. A very small increase in radioactivity of about 4-6 uSv/hr over the background counts was noted 18-24 foot away from the device, for example from 0.12 to 0.18 uSv/hr. When the americium was placed within the device there was a spike in the readings to 0.22 uSv/hr and a heavy atmosphere was noted. A general feeling of overcharge was noticed and the author’s skin began to feel somewhat sun tanned and sensitive. Also there was sensitivity to the metal springs in mattresses noted by the author which took a number of weeks to dissipate. The uSv/hr readings were lowered after airing and DOR-busting of the premises (using a small bucket DOR-buster and running water). A DOR-buster is metal tubes grounded into water and draws orgone and DOR (Deadly Orgone) into the water from the atmosphere or from an organism. 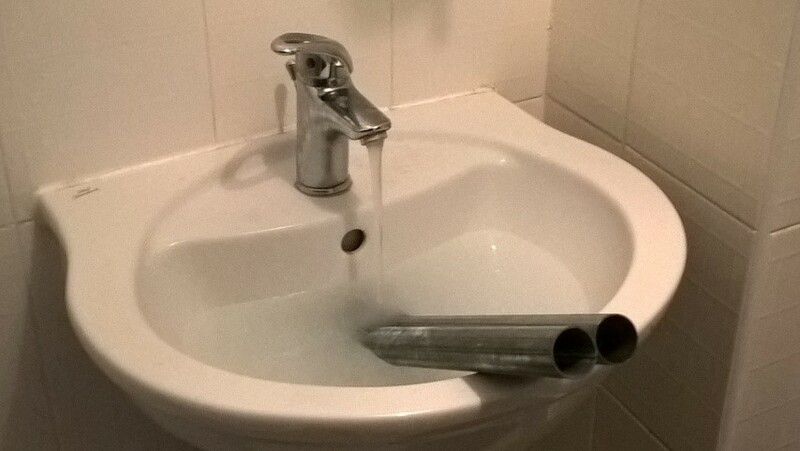 The DOR-buster was just 2 x two foot alloy metal tubes of 1 ½ inch diameter placed within a running sink so that the water runs over them. 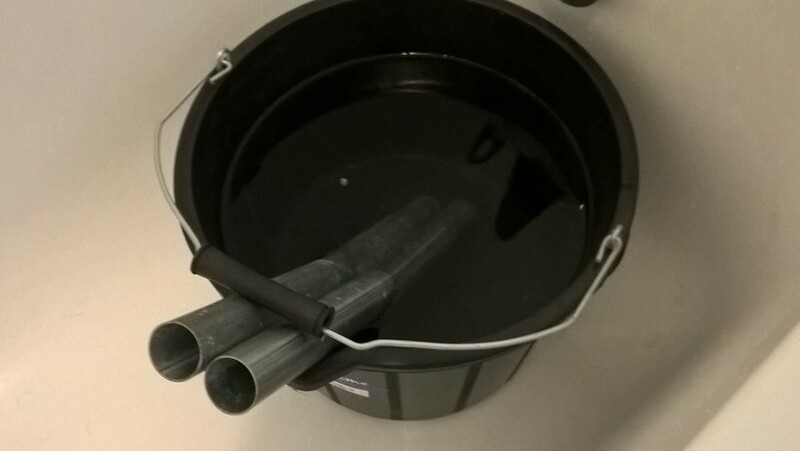 After this the tubes were left in a bucket to drain the area of DOR more slowly (as the water was then not running). When the device was in its new location three lots of 0.9 microCurie of americium (or 0.78 mcg of americium in total quantity) were brought within its field to a position of 1 foot from the device for about 5 minutes, this was done without the gradual conditioning period used previously where the americium was brought 50% closer to the device each week. After this the uSv/hr readings for about 40 foot around the building were suppressed to zero. The readings were suppressed in a circular area of about 40 ft radius from the orgone device. This was only observed once so might have been an observation anomaly or a meter fault, however the readings returned to normal 15 minutes later. A second anomaly was the reaction of one of the oranur affected orgone tubes. A psychotherapist who is also a psychic trance medium took the tube home with her for a number of days. She brought it back reporting that the tube was just too strong. The tube seemed to react to this person as though she herself was radioactive (she wasn’t radioactive). The Geiger readings increased to 0.28 uSv/hr when the tube was within a radius of 12 to 18 foot of this person and subjective observations also indicated a dense orgone field (this Geiger reading is about 3 times the normal background level). This effect settled down after the tube was no longer near her for a period of time. Other people did not have this effect on the tube. This effect did not reoccur in her presence as strongly once the tube was no longer kept at her premises, though she still has an energising effect on the large orgone device compared to other people. 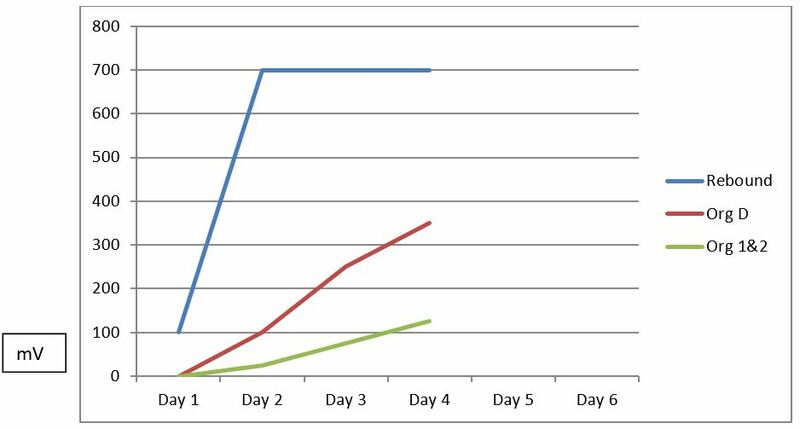 Lastly, there was a strange occurrence in that the uSv/hr readings for all four lots of americium at two locations all showed no uSv/hr or LE meter reaction for a whole day then returned to normal. Perhaps this is connected to some environmental/cosmic factor that is currently unrecognised. The author had thought that the americium exposed to the orgone device had possibly started to change into ORUR (orgonised post-radioactive substance) but this didn’t appear to be the case as the unexposed americium (kept in a separate building and over 40 foot away from the device) had also lost its uSv/hr and LE meter reading at the same time. Currently there is no americium near the device. With the gradual placement of the americium closer to the orgone device no great untoward effects appeared to have occurred. The actual levels of radioactivity used were tiny and were all within normal background levels in any case even when placed inside the orgone device (though on the high side of the normal range at this point perhaps). However, it gradually became quite clear that the orgone charge in the premises was just too over-powering. Certainly when the americium was within the device for a day it was uncomfortable. However the device feels fine now and the premises quickly reverted to normal on airing and DOR-busting. It appears the device itself continues to be somewhat ‘hot’ as even after being dismantled and put back together in the brick outhouse/garage it regained its former high charge literally within minutes (as measured on the LE meter). The device currently feels pleasant to be near to and has never actually felt unpleasant – it is just too strong to be near to for an extended period. It also seems to have possibly emotionally cathartic effects on sensitive people who are near to it for a period of time. 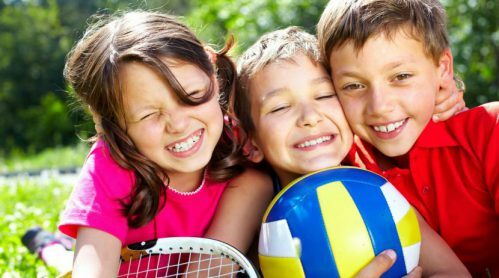 Within an extended field of perhaps 24 to 40 foot an oranur device can make young people or naturally energetic adults overcharged, though this effect is not constant. Use a separate uninhabited building at least 24, possibly up to 40 foot from any living quarters. Generally the equivalent of approximately a thousandth of Reich’s radioactivity was used (0.9 microCuries or 0.26 mcg of americium). One can acclimatise an orgone device to the presence of low level radioactive material. If moving low level radioactive material suddenly into the presence of an orgone device the results might be different or stronger. Monitor for changes if staying near to an oranur device for an extended period. Suntan effects and tingling on the skin have been noted even at this low level. The higher the orgone charge the stronger the interaction with the radioactive material. Parts of the oranur device remain ‘hot’ or different than before, permanently it appears. Oranur appears to have different qualities to orgone. Psychics and spiritual healers in particular reacted strongly to the oranur device. Oranur can have emotionally cathartic effects. It can also be dehydrating. It is also possible that oranur may have directly therapeutic effects in controlled dosages. It subjectively appears that it might be able to affect armouring to some degree and strongly increase orgone charge locally on the body. It also has a warming effect which feels agreeable at low doses. A small charged item, usually the small orgonotic compound from within the oranur affected device, was used to treat a number of minor ailments for short periods at a time (a few minutes) with apparent good effect. The author wondered whether orientating the orgone device with the cardinal directions would increase flow of orgone charge. Certainly ancient sites and churches are orientated in such a way. A good quality outdoor compass was obtained. However it was impossible to take a magnetic reading near to the device. The device deflected the needle by up to 180° near to it. Also the magnetic field around the device appeared to extend at least 6 foot. The magnetic effect remains after the removal of the americium from near the device. There is some deflection up to 9 foot away and 180° or more of deflection over the device. A large glass plasma ball of a type that when connected to a 9V DC electric current lights up with ‘lightning strikes’ and a light blue mist was placed within the orgone device and charged for 2 months. An increase in the reactivity of the ball to static charges had been noted for some time since the orgone charging began but it was very hard to photograph with ordinary camera equipment. Eventually a professional quality camera was used to take the following photograph (one of a series). The picture was obtained by placing cling-film over the plasma ball and then removing it quickly. 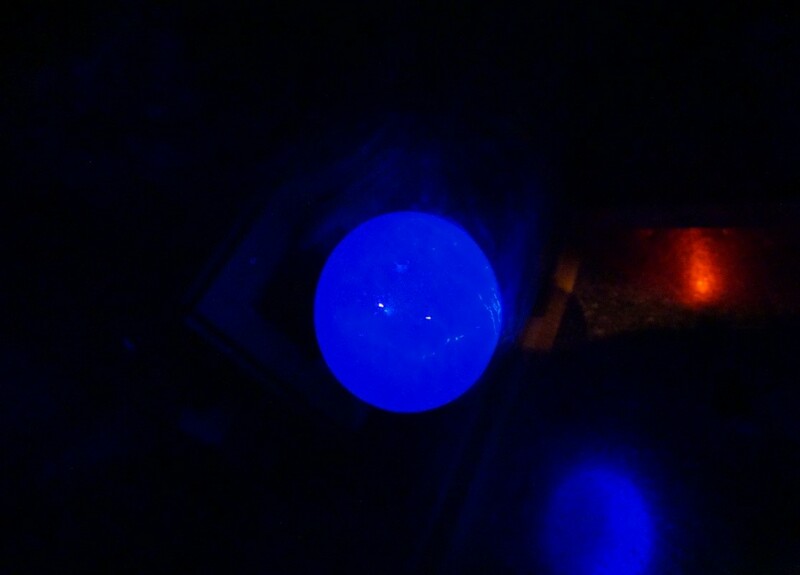 The static charge then caused the ball to light up showing a strong azure blue glow covering the whole ball. The photo was taken in the dark, with a flash inside the orgone device outbuilding from a distance of about 6 foot by a second person. The strong azure blue glow is clearly visible to the naked eye. Flash-lights from cameras do not produce by reflection blue glows of this type. Both line voltage and battery voltage was put through the plasma ball after a month of orgone charging and neither produced any unusual effects or strong azure blue luminescent glows. Rubbing the uncharged plasma ball with plastic or by hand did not produce glows. Alongside the Italian orgone and electric currents research (10) and of course Reich’s original vacuum and Geiger tube work in the The Oranur Experiment, First Report (11), the author is confident that an orgone to electrical conversion takes place within ORACs. It would appear that a strong, oranur-influenced orgone device is perhaps capable of precipitating the accumulation of electric charge in devices such as capacitors and even in chemical batteries, though there is much more work to be done in this regard. It would also appear to be possible to conduct controlled, small-scale oranur experiments as long as certain precautions are undertaken and one is careful not to proceed too quickly or with anything other than very small amounts of excitatory material (radioactive elements) until more is known. The author would recommend not at first exceeding approximately a thousandth of the quantity Reich used or around 0.9 microCuries of americium or equivalent. Natural sources of radioactivity as used by some healers might be one possible activation method. Experiments should also be under the supervision of experienced orgone researchers or qualified scientists. The author does not recommend oranur experiments being conducted by non-qualified or inexperienced persons. A team led by the Spanish physicist Milian previously confirmed a radioactive and electrical capacitance anomaly in ‘modified faraday cages’ (a term for orgone boxes that is more acceptable within physics journals), (12). Their initial experimentation was carried out in the 1990s and was presented to the European Society for Scientific Exploration in 1998 (13). A brief synopsis was published in 2002 in Pulse of the Planet journal (14). Since then the Spanish physicists have also reported their anomalies to have a correlation to cosmic weather conditions (15). Their formal papers, now in mainstream physics journals, have been published in recent years but the actual experimental work dates back to the 1990s as noted. Maglione has also examined various oranur effects, including those of Milian in his extensive and in-depth book covering Reich’s oranur work in a broad scientific context including that of the Ark of the Covenant – an exceedingly strong radioactive oranur device, a device similar in many ways to Reich’s oranur set up but perhaps a thousand times stronger (16). This is only the second experimental investigation of oranur effects since Reich to be published. 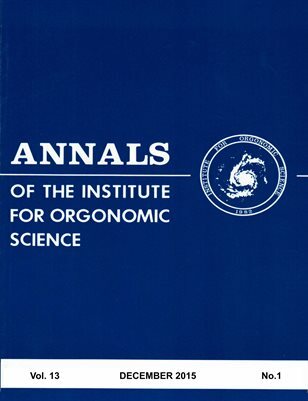 It is also the first full article on oranur in the orgonomic journals since Reich published CwS in 1957. Hopefully, the future will see more work in this under-explored area of orgonomy. Ran clock 48 hours then another 10 hours after second charge. Ran clock for 4 days. Was own control – zero charge on two voltmeters. Went from ‘flashes’ day 1 to 5, day 6 – 410 mV, day 7 – 610 mV. Charged 1 month and ongoing. Two D sized batteries charged 5 days. Voltage range before and after charging was 12.1 to 189.6 mV. The charged batteries had 100% increase in mV approx. The control battery had 50% increase from its starting point. Part charged, batteries, 2nd Set, used, stable batteries, mix of rechargeable and non-rechargeable types. Control D size battery placed in similar light, heat and static conditions. D size and C size charged in device for 2 weeks. Both Control and Test batteries in the D size gained a few mV. No difference between Control and Test in D size. The C size Test (orgone) battery gained 100 mV from a higher initial charge (7.1 to 7.2V). Experiments with part-charged batteries remain ongoing. Same type of capacitor at room temp in orgone device. Range 33 to 220 mV after experiment (both groups). Over 7 days of charging and daily recording the orgone capacitor gained 100% compared to the control capacitor. Set of 10 Capacitors in two plastic containers kept at similar temp, light and static charge conditions. The same capacitors were zeroed and used as experimental and control. Similar light and temp. Weather similar, December 2017. Range 13.8 to 94.3 mV after experimental periods (both groups). The orgone capacitors averaged 25% to 50% higher mV readings (10 to 20 mV higher than control). The orgone layered companion capacitor was many times higher in experimental group compared to control. The orgone charged capacitors were all higher than controls by a differential of between 1 and 22 mV. The biggest differentials were with the proximal orgone-layered capacitor and its immediate companion. Set of 4 identical capacitors. Same temp, light and experimental period. Same type of plastic box without orgone layering placed inside cupboard. 12-14 foot from orgone device. Set of 4 identical capacitors. Same temp, light and experimental period. Contained in orgone layered small plastic box placed within orgone device. Range 0 to 16.9 mV after 24 hours. Orgone charged capacitors were four times higher than control capacitors after 24 hours. Over the next week the charges gradually equalise between orgone and control groups. Bag of 30 mixed capacitors orgone charged for two months in orgone device. Relatively high mV charges were found between 3 mV and 505 mV depending on the size of the capacitor. 6 capacitors were tested out of 30 charged. All 6 had high mV charges. Approximate values for unused capacitors had been noted but not from this set. A proximal effect of storing capacitors in groups appears possible. It might be useful for future capacitor experiments to take any such group effect into account. An identically treated room next to the orgone device room was used as control (as the temp from the orgone device affected at least 6 foot around the device). Temperature was recorded with a good quality electronic thermometer accurate to 1/10th degree °C in Control Room, Orgone Room and Orgone Inner Box for three weeks approx. Temperature in experimental (To) and control (T) room were taken at the same height. The rooms and premises were both left unheated and were on the same side of the building with the same windows and room volume approximately. Other heat sources in the premises were off for the duration of the experiment. Control readings of a low charged hand and high charged hand were taken to establish comparative levels of ‘orgs’ or orgonotic charge. Orgone charge readings 9 foot from the orgone device, 3 foot from the device, the outer wall of the device and inside the device were taken with a Heliognosis Life Energy (LE) Meter Model II. Although an older model it had been stored in a custom built, cushioned, wooden crate and was in good working order. Readings gradually increased as expected nearer to the orgone device. The inner boxes of the device were strong, consistently at 100% on the meter scale after some weeks. The LE meter readings of the americium were suppressed when the americium was near the orgone device compared to 9 foot away. Control readings at two locations were taken repeatedly to establish background levels of mSv/hr. mSv/hr were measured at 24 foot from the device, near to the device and inside it. mSv/hr readings were also taken of the 0.26 mcg of americium-241 contained in the smoke alarm (the americium contained was 0.9 microCuries in activity). Readings were taken with a new Radex One Geiger Meter. The mSv/hr readings were within normal limits though above background by about 0.02 to 0.06 mSv/hr within 18-24 foot of device. The readings were suppressed by about 0.02 to 0.06 mSv/hr next to the device compared to the readings away from the device. Readings within the device were similar to those taken just outside it. When the americium was placed within the device there was a spike in readings to 0.22 mSv/hr. The americium was very low in radioactivity being around 0.06 mSv/hr above the background of 0.12 mSv/hr (when measured away from the device prior to experiment) or 0.18 mSv/hr absolute reading. Compass reacted normally away from orgone device. The compass was passed across the orgone device slowly with sweeping motion. Compass was deflected by around 180° during sweep. Compass could not be used normally near to device. Magnetic field appeared to extend at least 6 foot. The same plasma ball was checked for static charge reactions prior to the orgone charging, by rubbing with plastic film and with hand. Very minimal sparking type reactions were present similar to when it is connected to voltage but to a much lesser extent when rubbed. Plasma Ball placed in orgone device for 2 months. A strong azure blue, luminescent glow was noted in streams and over the whole ball when plastic cling-film was placed on the ball and then quickly removed (providing a small static charge). No external electrical current was applied to obtain the strong blue glow. Normally a very light blue mist, stronger at the diode, and electrical ‘lightning’ is produced when the plasma ball is connected to DC voltage. 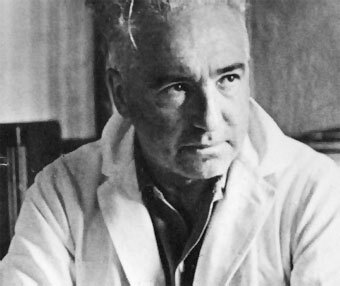 Reich, W. The Oranur Experiment, First Report (1951) Reprinted by the Wilhelm Reich Trust, Maine, USA. Reich, W. (1951) The Geiger Muller Effect of Cosmic Orgone Energy pp208, from the The Oranur Experiment, reprinted by www.WilhelmReichTrust.org. King, S. (1977) Pyramid Energy Handbook, US, Warner. Southgate, L. Accessed Jan 2018, http://orgonecontinuum.org/reich-biblio.html (See Experimental Section or Search TO-T). 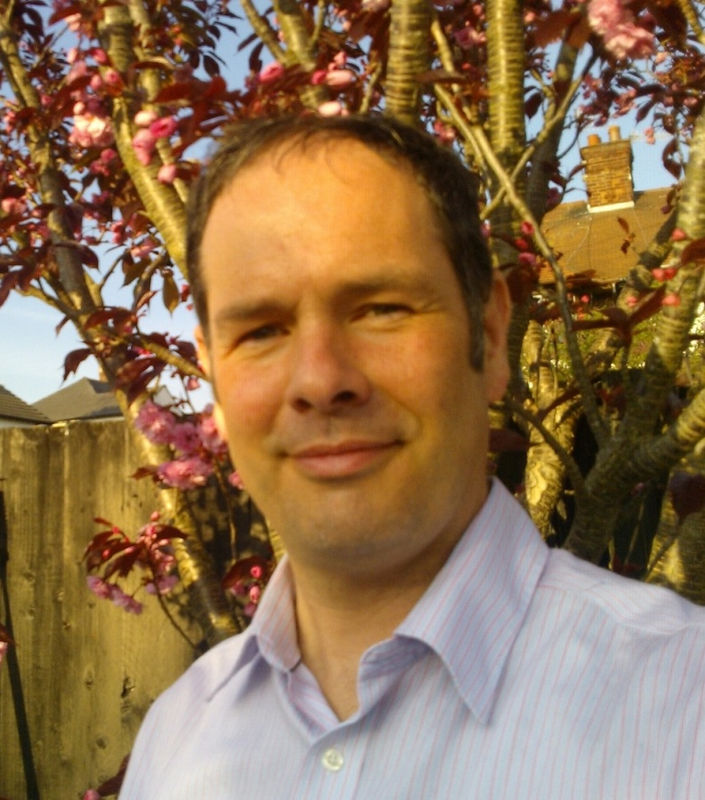 Maglione, R. and Ferrari, D. Accessed Feb 2018 http://www.psychorgone.com/orgone-biophysics/electric-currents-in-orgone-devices (first of a series of three also published by Journal of Psychiatric Orgone Therapy at the same site). Reich, W. The Oranur Experiment, First Report (1951) Reprinted by the Wilhelm Reich Trust, www.WilhelmReichTrust.org, Maine, USA. Milián-Sánchez V. et al (2016), Anomalous Effects on Radiation Detectors and Capacitance Measurements inside a Modified Faraday Cage Nuclear Instruments and Methods in Physics Research Section A: Accelerators, Spectrometers, Detectors and Associated Equipment, Volume 828, 21 August, Pages 210-228. See also Feb 2018 https://www.sciencedirect.com/science/article/pii/S0168900216304405 for synopsis and PDF. Milian, V. (1988) Proceedings of the European Society for Scientific Exploration, 9-12th October 1988, Valencia, Spain. Milian, V et al (2002) Confirmation of an Oranur Anomaly, Pulse of the Planet pp182.